The thirty-sixth Soundtrack of the Week is Sholay by Rahul Dev Burman. R. D. Burman must be the most famous name in Indian film music, and Sholay is one of the most famous Bollywood films. The story is basically Seven Samurai or The Magnificent Seven, but this time it's just two guys who save a village from evil bandits. Burman's music is great. Among the instruments used are something that sounds like it could be a cymbalom or some kind of hammered dulcimer and something that sounds like it could be a synth-tabla. Like all of the Burman music I've heard, it's propulsive and melodic, infectiously rhythmic and lyrical. The lyrics are by Anand Bakshi. 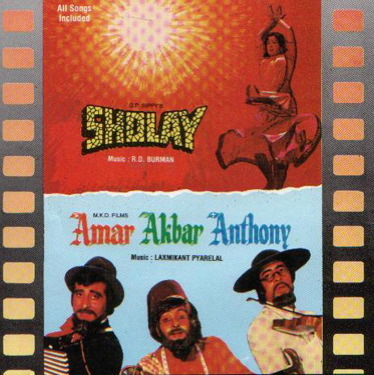 The CD I have of Sholay pairs it with another soundtrack, Laxmikant Pyarelal's music for a movie called Amar Akbar Anthony. It's decent, listenable music but nothing special, I think.